Implementing parental controls on iOS and Android can only restrict the downloading of age specific elements from each systems’ application (app) store. However, the default Web browsers for Android and iOS do not provide parental controls similar to the V-chip in your television. 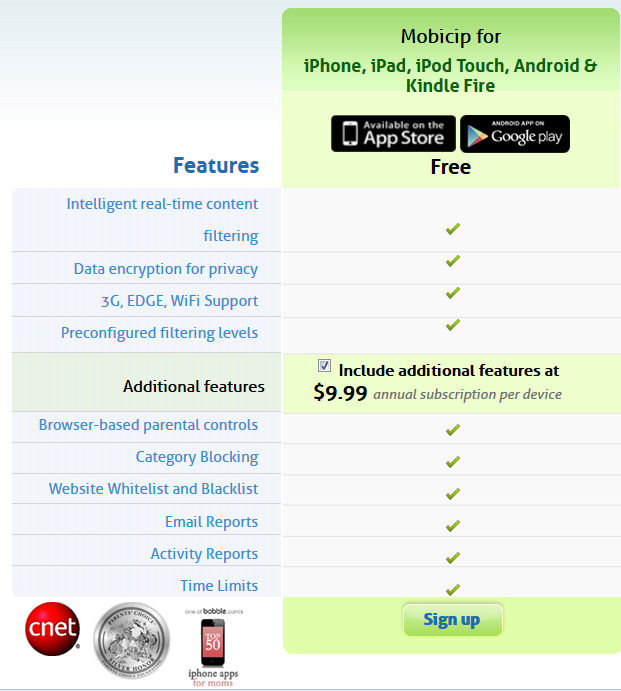 This is were the Mobicip mobile Web filter is beneficial. 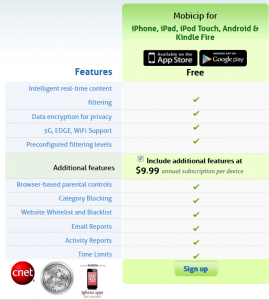 The Mobicip Web filter is a a downloadable browsing app from Google Play and iTunes for $4.99 free. It is configurable via a Web-based interface with some services that come with the app and then a paid service for $9.99 per year to add supplemental features. Figure 1, on the right shows the available features between the paid and free services. Mobicip’s Web site offers a 10 percent discount on the annual subscription with the code MOBICIPFAQ. One of the things most liked by parents is the Web filtering capability especially when it comes to YouTube. Mobicip bases each search upon an age range in the default version and by category in the yearly subscription version. For parents of older children, they can set up the browser in “accountability mode” which will send the parent daily reports of activity and not filter the content. Select App Store and search for Mobicip and install the app. Create a new account on the phone or login with an existing Mobicip account. Select the appropriate filtering: high school, middle school or elementary school. Select Google Play Store and search for Mobicip and install the app. Launch the Mobicip app from the device. Select appropriate filtering: high school, middle school or elementary school. Select menu > more > settings. By default, the app will restrict the deletion and installing of apps in Android. Select “App Restrictions” in settings and enter your Mobicip password. Block the Android default browser and any other browsers on the device. If you need complete parental control for the iPhone/iPad, consider FREE McGruff SafeGuard. You may remember McGruff “The Crime Dog” – Take A Bite Out of Crime – from your youth. They also offer have a PC-based Parental Control software: (http://www.GoMcGruff.com). McGruff SafeGuard provides a Child Safe Browser app which is identical to Safari, and offers a parent with full control of the categories of websites that a child can visit. It also sends a summary of activity to the parent via email. Unfortunately, the FREE McGruff SafeGuard app is not available in iTunes. I tried to download it in iTunes and it says it’s not available in the United States iTunes Store. Do you know what countries it works within? Will it be available in the US soon? Really appreciate the shout out! There is surprisingly little awareness that the iPad is a computer and that young users are a click away from potential trouble. Just wanted to let you know that we have made the Safe Browser app free for now. It is an experiment to see how our users like the new pricing model. Please do check it out when you get a chance at http://www.mobicip.com/pricing. Great news! I just Tweeted the news and will update the story as soon as possible. I’ve been using the app for years and am very pleased.